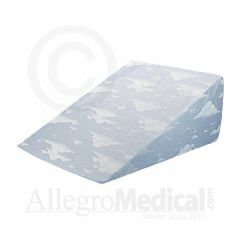 Bed Wedge is a popular addition to a comfortable bed. Choose from 3 different degrees of lift to elevates the upper body or legs. Also helps treat the symptoms of hiatal hernia and reflux disorders. Covered with a cotton/poly blue cloud fabric. 24”x24” (56cm x 56cm). Can't wash it. Pillowcase too thin. The foam holds up great but the pillowcase provides very little protection for the foam even if you wash the pillowcase repeatedly- which is reallllly hard to get on and off. Before you know it, the wedge is stained from your skin and smelly from normal sweat if you sleep without a shirt (my husband). The wedge lasts longer if you do sleep with a shirt on (me). But unfortunately, it's the best wedge I've been able to find. solid construction. comfortable. attractive design. Travelability. I am unable to lay flat so I have been limited in travel. With The Bed Wedge I am able to sleep away from home. Was too high so cut it in half. Too hard. Wound up purchasing a body pillow and placing it under my mattress. Got the job done and not as dramatic and way cheaper if you do it to begin with. Wedges went to Goodwill. solid construction. Easy to Control. attractive design. Multiple Positions. I purchased the wedge because I am more comfortable sleeping elevated right now because I am breastfeeding my baby. I also plan to use it during the winter months when I get head colds. I like the design on it as well as the angle. It is pretty hard and uncomfortable though. And, I find it difficult to stay up on it; I tend to slide down. However, I have not seen another one like it and it does a good enough job. Easy to Control. Multiple Positions. Caregiver. needed this for years. My foster son doesn't sink down as he did using a normal bed pillow. His trach breathing is much easier. I like the fact that it folds for easier daytime storage. I bought this bed wedge from Sammons Preston years ago. Back then it had a vinyl cover. Now it has a cloth cover. With the vinyl cover, it helped keep it clean, but I would sometimes slip downward. With the cloth cover, it probably won't keep the dust mites out. Do you have a dust mite protective cover or do I have to make one? How do you clean one of these properly w/o washing it? How long is this wedge? Does it reach from head to waist on grown man? If the cover is 24" by 24", chances are its 24" long and 24" wide, since we already know the height. What are the dimensions of the pillow? I know the height but not the other dimensions. Wish I remembered all that geometry I learned in High School, could use the height and angle to at least figure out the length. Wouldn't be much use on width though. I'm currently in a Skilled Nursing Facility recovering from major back surgery. The wedge I used in the exercise lab, which felt real good for sleeping if needed, was 12 inches high (same as this one), 24 inches wide and 28 inches long from the top edge to the mat. Hope this helps. How do I wash a foam wedge pillow ? Cover the wedge with a blanket to sleep on. Then you just have to wash the blanket.